This roast chicken and vegetables recipe is simple as can be. Rub the chicken with spice and salt. Toss in some carrots and sweet spuds. Shove it all in the oven. All with a single pan. Accept accolades. Barely spend any time cleaning up. See? Easiest recipe ever. 2. In a small bowl, combine the paprika, dried oregano, if using, and salt. 3. Pat the chicken completely dry inside and out with paper towels. Rub the outside of the chicken with 1 tablespoon olive oil and then sprinkle the chicken all over with the paprika mixture. If desired, tie the legs together with kitchen twine and tuck the wing tips beneath the body. Place the chicken on a rimmed baking sheet or in a large roasting pan. 4. Toss the carrots and sweet potatoes in a large bowl with the oil and season with salt. Scatter the vegetables around the chicken in a single layer. 5. Roast the chicken and vegetables for 20 minutes. Flip the vegetables and add the garlic to the pan. Continue to roast until an instant-read thermometer inserted into thickest part of a thigh reads 165°F on an instant-read thermometer, 30 to 50 minutes more, depending on the size of your bird. Keep an eye on the chicken during roasting and, if needed, loosely tent the chicken with foil to prevent overbrowning. Transfer the chicken to a cutting board and let rest for 10 minutes. Meanwhile, check the potatoes and carrots for doneness. If necessary, return them to the oven and roast until golden. 6. Spoon the pan juices over the chicken after carving and instruct guests to squeeze the garlic from the papery husks onto the chicken or, if desired, slices of bread. I love this recipe for multiple reasons and I've already made it several times—it's one of my favorite roast chicken recipes. The recipe itself is simple to follow, no marinating time necessary, simple ingredients, and hardly any prep. The end result is flavorful and has all the main components for a meal—the chicken, veg, and starch. I love how the paprika spice rub magically imparts a lovely flavor and color to the roasted chicken. I've always used the dried oregano. Wait the 20 minutes as the recipe instructs to add the garlic or it may get too dark. The whole roasted garlic cloves are otherworldly and a whole head of garlic somehow always manages to be devoured. I roast the chicken on a large sheet tray lined with parchment paper and toss the veggies in olive oil, salt, and pepper right on the sheet tray prior to placing the chicken on. I just move my veggies to the corners to make room for the star of the show. I even throw a few extra carrots in the mix because they are so delicious roasted. I usually have the butcher cut the backbone out of my chicken so it lays flat on the sheet tray. This recipe is a winner! Loved the relative simplicity and ease of this recipe. We make a roast chicken at least once a month and normally use the same recipe. But I loved the spice combo in this one for something different. We did not use oregano (all out!). We did not truss the chicken as I don't find it necessary—it's just an extra, messy (and, for some, tricky) step. We placed the chicken on top of the veggies rather than scatter them around the bird. Not sure about placing the chicken directly on a baking sheet as it might burn and the veggies protect it from that. We peeled and halved the garlic cloves rather than leave the whole head in there unpeeled. I used potatoes rather than sweet potatoes and they crisped up nicely! I'd say you definitely need a meat thermometer. The chicken definitely needs pan juices poured over just before serving. I think I found a new way to make my roast chicken. This roast chicken and vegetables recipe is simplicity at its best—plus amazing flavors and juiciness. Everyone absolutely loved this recipe. Also, mixing the carrots and sweet potatoes together was a perfect combination for 2 reasons: First, they are both sweet and with the juices from the chicken they were a perfect mix of salty and sweet; second, both my daughters are not big fans of carrots, but they ate them thinking they were all sweet potatoes! BIG BONUS! The timing was also perfect for both the chicken and the veggies. This is one to make again with or without the veggies. This roast chicken and vegetables recipe is an easy method for roasting chicken—it's in the oven in about 15 minutes and the result is a delicious roast chicken, full of flavor, with carrots and sweet potatoes. We served 5 hungry people with this recipe and everyone asked when we will make this again. Next time, we will make twice the amount of roasted vegetables because they were gone too quickly. And the pan juices are terrific over the meat. Our chicken needed the full 55 minutes for the juices to run clear. We tented it in foil after 40 minutes in the oven. We also roasted the vegetables for 10 more minutes, until soft, while the chicken rested. A wonderful meal. Everyone should be able to make a perfect roast chicken, but many years of cooking has taught me that it is not so easy. This roast chicken and vegetables recipe, however, is a great one. I started with a really fresh organic chicken and followed the recipe to a T. It took 15 minutes to prepare and I was pretty sure it was done at an hour and ten minutes. This was tasty and moist. The spice rub gave a beautiful color as well as flavor. I used the optional oregano and think you should not leave it out! I did need to tent my chicken at the end as it was browning a bit too fast. My potatoes and carrots did not need additional time—I assume that has to do with how large the pieces are. They were absolutely delicious and I think that a green salad would be the perfect addition to this one pot dish. This is one heck of a good roast chicken and vegetables recipe. It's very flavorful and has that crisp skin that never makes it to the table. It is also, according to my tasters, one of the best roast chickens I've made. All totaled the time from kitchen counter to table was 1 hour, 40 minutes. The potatoes and carrots were perfect without any additional cooking. Warning: Slice the chicken on a rimmed platter because otherwise the juices will run off the cutting board all over the place making a mess. That way you can save them for the sauce. As far as the garlic goes, just peel the extra papery husk and cut it into cloves. Push it aside when removing the vegetables then scoop the remaining out and peel and save for another use. I felt that I needed some more gravy so I made a pan gravy with the drippings and a little chicken stock and some flour. I also made an herb stuffing as an accompaniment. Do add the oregano. When all is said and done, the seasoning is perfect, the veggies are tender, and I've been requested to make it again. The recipe needs no changes at all except to say adjust time according to size and take that little pop-up thingy out and toss it. Use a meat thermometer and you will not go wrong. This is a definate keeper. I have one question about this roast chicken and vegetables recipe, and it's "How can something so simple taste so delicious?" The wonderful aroma that filled the air while the chicken roasted was the first hint that this recipe would be a keeper. The roasted chicken was juicy, deeply flavorful, and I could hear a cracking sound as I tore the crisp skin. The juice from the poultry and the garlic-roasted carrots and sweet potatoes were a perfect match. A one-pot meal that I served with a fresh baguette. Finger-licking good! This flavorful roast chicken and vegetables recipe will certainly be on the top of my list of recipes! This roast chicken and vegetables recipe was a really great alternative to traditional roast chicken. The paprika wasn't too overpowering, the oregano was subtle, and the chicken was moist and tender. But the sweet potatoes knocked my socks off! I'm usually just so-so on them, but these were caramelized so nicely with the carrots. I'd get a soft bite of carrot and sweet potato along with the crunch of the caramel. Sooo very good! The garlic was soft and added a nice flavor. The prep time and cook time were right on. Everything was done when I took the chicken out of the oven, so it didn't need any further cooking. It didn't produce a lot of pan juices, but much more of an intense, concentrated syrup. Really, really tasty! Look no further than this roast chicken and vegetables recipe for a seasonal star for your fall dinner table. This platter of roast chicken produced a winning main course. The carrots and sweet potatoes were nicely caramelized by the time the platter was ready to hit the table. Of course, these orange root vegetables are good at any time of year, but they seem especially suited to the crisp air and leaves changing color outside. The paprika rub was a pleasing addition to the chicken skin, but made tying the chicken and tucking the wing tips a slippery prospect. It was hard to keep the rub applied evenly after grappling with the bird, and I ended up sprinkling a little additional paprika on the legs to get fuller coverage. When I cut my garlic bulb in half crosswise, it broke into a lot of fragments and segments, which I transferred to the baking pan. Scattering loose cloves among the vegetables would probably work as well. The recipe doesn’t specify what to go with the roasted garlic, so I squeezed it out of its paper and onto the serving platter. I am a sucker for any roast chicken recipe. It's one of my favorite comfort foods, and I love to try out new versions of the classic as often as I can. I was drawn to the rub of smoky paprika, oregano, and salt for this roast chicken and vegetables recipe. Not only that but I love when a recipe calls for roasting veggies alongside the chicken itself—in this case, the recipe called for carrots and sweet potatoes, but I have to admit, I added some halved Brussels sprouts to lend the meal a touch of green. And I adore the idea of roasting a whole head of garlic along with the roast chicken and vegetables as it's tasty when eaten with the chicken and vegetables, and also great to eat on bread and dip in the juices as well. In terms of the roast chicken and vegetables recipe itself, I did tie the legs before oiling and rubbing the chicken with the paprika mixture so it wouldn't be as messy. When it was done, it had a lovely reddish-brown crust from the seasonings. I loved the flavorings and the veggies and the garlic! A super recipe for the holiday season. This roast chicken and vegetables recipe was delicious. The timing depends on the size of the bird—mine was over 5 pounds, so it took the full time to roast, at which point the vegetables were done. The chicken was moist and the skin was crisp. 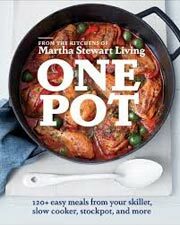 Roast Chicken and Vegetables with Paprika Recipe © 2014 Editors of Martha Stewart Living. Photo © 2014 Christina Holmes. All rights reserved. All recipes and photos used with permission of the publisher. This is the best dish ever. I make it all the time. 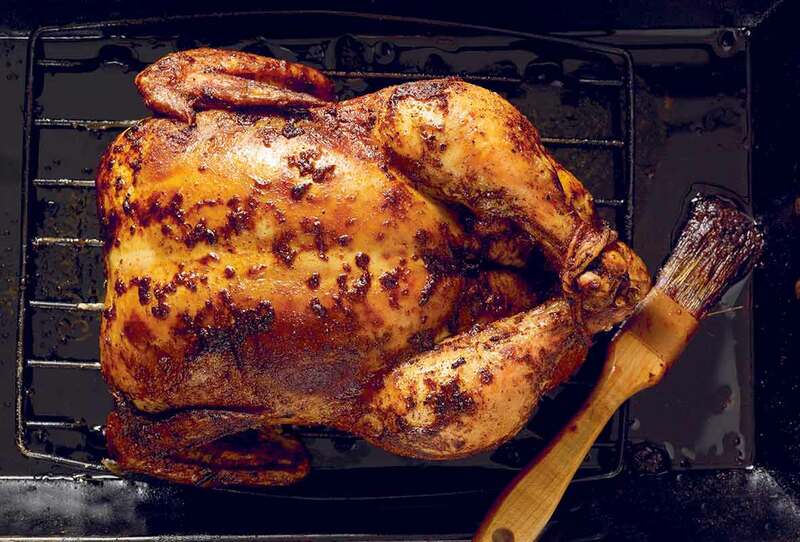 If I’m home on a Sunday – roast chicken is what it’s all about! Thanks for sharing my recipe, by the way! Aida, you are so very welcome. Thank you for such a lovely and doable approach to Sunday supper! We’re thrilled to know that this recipe is yours. Big fans over here. Thank you for this simple and easy twist on a roasted chicken. I roast a whole chicken at least once or twice a week and it gets a little dull. I usually make my veggies separate, too, but I’m going to try this way and throw them all in the same pan! Also, I love the idea of roasting the garlic and smearing it on the chicken for flavor. Seems so simple but I’ve never thought of it. You’re so very welcome, Tara. Much as I love a plain and properly roasted hen, I’m with you on the need to jazz things up once in a while. So pleased to hear that this recipe does the trick for you! You should smell my kitchen right now…….cant wait to dig into this! This was fabulous!!!! Though I will forever love a “classic” roast chicken, this is a wonderful variation to keep in my arsenal. The vegetables really put it over the top…they were so perfectly carmelized. YUM! Tonight, the carcass is burbling on the cooktop with carrots and onions and such and I just know the broth is going to be wonderful too. Am so pleased to hear it, Karen. Greatly appreciate you taking the time to let us know. So happy you like it as much as we do.